I loved The Word is Murder, Anthony Horowitz’s first book to feature the detective Daniel Hawthorne, so when I heard that there was going to be a second book I couldn’t wait to read it. I didn’t have to wait too long, as this one has been published only a year after the first, and I’m pleased to report that I enjoyed it just as much, if not more. When high profile divorce lawyer Richard Pryce is found bludgeoned to death with an expensive bottle of wine, the culprit seems quite obvious. Just days earlier, Pryce had been threatened by a client’s ex-wife who poured a glass of wine over his head in a restaurant. Surely that can’t be a coincidence? But Pryce has plenty of other enemies, whose identities come to light as investigations continue. Could one of them have wanted him dead? And what is the significance of the numbers painted on the wall near Pryce’s body? As this is clearly a more complex case than it seemed at first, ex-police detective Hawthorne is asked to assist with solving the crime. 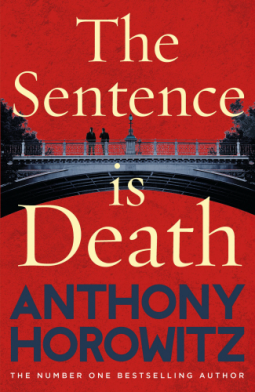 Having worked with Hawthorne on his previous mystery in The Word is Murder, author Anthony Horowitz reluctantly agrees to team up with him again and document the progress of the investigations in a second book, The Sentence is Death. Hawthorne is supposed to be the hero of the book, but this time Anthony decides to do some detecting of his own in the hope of reaching the solution first. Can he solve the mystery before Hawthorne does? If this sounds confusing, I should explain that, as in the previous novel, Horowitz is a character in his own book. The Anthony in the story is clearly based on the author himself – he frequently discusses his career as a novelist and screenwriter and refers to his wife and his publisher by name – yet he interacts with fictional characters, takes part in fictional storylines and struggles to solve the mystery the real Horowitz has created. I think it’s a clever concept and great fun, though not everyone will agree – it’s probably something you’ll either love or you won’t. It’s not really necessary to have read the first book before starting this one as the mysteries are entirely separate. Like the first, this is a strong, well-constructed mystery with plenty of clues but plenty of red herrings as well. I didn’t manage to solve it (I confess that I allowed myself to be distracted and misled by every one of those red herrings) but I was happy to be kept in suspense and wait for Hawthorne – or Anthony, of course, if he got there first – to explain it all for me. However, I would still recommend reading both books in order if you can, so that you can watch the progression of Anthony’s relationship with Hawthorne. Hawthorne is no more pleasant or likeable now than he was when we first met him in The Word is Murder, and he is still every bit as much of an enigma, but we do pick up a few new bits of information about him here, with some glimpses of his home and his life away from his detection work. I think he’s a great character, for all of his flaws, and I love his partnership with the fictional Anthony. When I read the first novel I found the details of Anthony’s publishing and television career a slight distraction from the main plot, but in this book they seemed to form a more intrinsic part of the story and I liked that aspect much more. Horowitz seems to be having fun at the expense of his fictional self, as Anthony stumbles from one disaster to another; I particularly enjoyed the opening scenes on the set of Foyle’s War and a later scene involving the theft of a book – and I’m curious to know whether the literary fiction author Akira Anno was based on a real person (although if she was, I doubt her true identity will ever be revealed). I loved this book – and the good news for Horowitz and Hawthorne fans is that there’s going to be a third. Thanks to Century for providing a copy of this book for review via NetGalley. I like the idea of Horowitz inserting himself as a fictional character in his books. It sounds clever. I’ll definitely be reading his books. I got the first one in Kindle. It’s a great idea, isn’t it? I hope you enjoy the first book! I have this on my kindle from netgalley too. The first book was a clever read, at times it felt like you were reading an autobiography but then it developed into something else. Glad to know Hawthorne is still unpleasant! I hope you like it as much as I did, Jo. It doesn’t have the novelty value of the first book, as you know what to expect, but it’s still a clever, fun read. What an interesting concept. Had not heard of these books so thanks for bringing them to my attention. You’re welcome. I loved both of these books and I can also recommend one of Horowitz’s other mysteries, Magpie Murders. I also have a copy of this book, which I’ve just started to read – I too also enjoyed the opening scenes on the set of Foyle’s War. I hope I’ll enjoy the rest of the book as much as you – I’m expecting to as I loved The Word is Murder. I hope you continue to enjoy it, Margaret. I think I liked this one even more than The Word is Murder. I should look into these, are they graphic or gory in any way? I enjoyed Horowitz’s Holmes books. No, I don’t think they’re particularly gory. They have the feel of old-fashioned whodunits. You might also like Magpie Murders if you haven’t read that one yet. This sounds extremely interesting to me. Oh, so many good books! Yes, if only we had more time to read them all! I think it’s clever and fun, but I can see why it wouldn’t work for everyone. I don’t think I’ll continue this series. I really didn’t like his decision to include himself as a character. I don’t know why, but it made me uncomfortable. It’s an unusual idea and I can understand why not everyone would like it. I might try one more, but I also thought he cheated a little on his mystery, not giving us some information we needed to figure out the solution. This does sound good – is it a bit like the Ellery Queen mysteries? 2 for the christmas list! I think you should definitely put them on the Christmas list! I haven’t read any Ellery Queen, but it does seem like a similar idea.